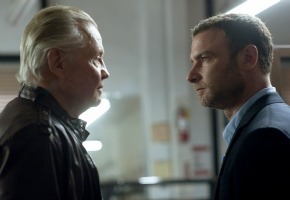 New US drama series Ray Donovan will screen express from the US in July on Showcase. Liev Schrieber stars in the title role as Ray Donovan, the go-to guy who makes the problems of LA’s celebrities, superstar athletes, and business moguls disappear. In the role of his father is Jon Voight, unexpectedly released from prison, setting off a chain of events that will shake the Donovan family to its core. Also cast are guest star Elliott Gould as Ray’s long-time client and mentor, Paula Malcomson (The Hunger Games) in the role of Ray’s wife, Abby, along with Eddie Marsan (Sherlock Holmes) and Dash Mihok (I Am Legend), who will play Ray’s brothers. The cast also includes Katherine Moennig (The L Word), Pooch Hall (The Game), Steven Bauer (Breaking Bad), Kerris Dorsey (Moneyball) and Devon Bagby. Jonathon Schaech (That Thing You Do!) and Peter Jacobson (House) guest star. Ray Donovan is created and executive produced by Ann Biderman (Southland), with Mark Gordon and Bryan Zuriff also producing. It begins Tuesday July 2 at 8.30pm on Showcase.